I love this sandal. It is so comfortable and very stylish! 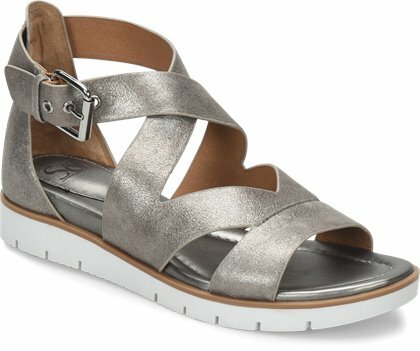 These sandals are the epitome of comfort, fit true to size and can be worn all day walking without cramping or hurting in any way. The leather is soft. Instead of a flip flop, these are my go-to sandals now. I love these sandals. They are so comfortable and very good for doing a lot of walking. They are true to size with no fit issues. The leather is extremely soft and shoe bed is padded. Has been too cold to wear right now, but I am looking forward to wearing this comfortable shoe! Very comfortable and supportive. Metallic color goes with everything. Can wear with shorts, skirts, casual dresses, crop jeans - so cute! This is a great shoe. Very comfortable and looks great! 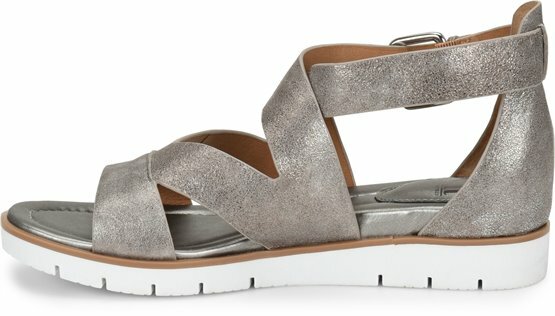 These sandals are very comfortable, they have a thick comfy sole, and they look good with any outfit. I just received a third pair for my fussy feet.....Im working on getting all colors. Love these sandals so comfortable ! I LOVE these sandals, super comfortable. I have very flat wide feet and they provide a lot of cushion and arch support. I highly recommend this very well made sandal. The most comfortable sandal I have ever worn; I pray they last a long time. Perfect color; I'm so glad they made more in this color.